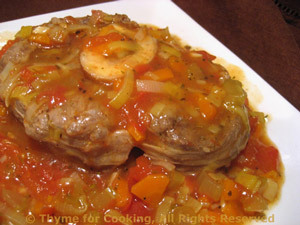 Osso Bucco, an easy, gourmet main course from Thyme for Cooking. Trim and wash the leek, Roughly chop. Finely chop the carrot and celery. Heat the oil in a heavy Dutch oven or deep skillet. Add the leek, carrot, celery, garlic and sauté until tender, about 5 minutes. Move vegetables to the side. Add veal and brown on both sides, about 7 minutes total. Add wine, broth, tomatoes and herbs. Cover, reduce heat and simmer for 60 minutes (or longer). Remove veal and cover to keep warm. Stir in the cornstarch mixture until sauce is thickened and no longer cloudy. Spoon sauce over the veal shanks and serve.